Triceratops was the three horned plant eater which most artists always draw it killing the bigger predator. Many dinosaurs got a similar look with Triceratop. Most of them were smaller, and some got less horns or no horn. An interesting asumption is these dinosaurs might be young Triceratop. 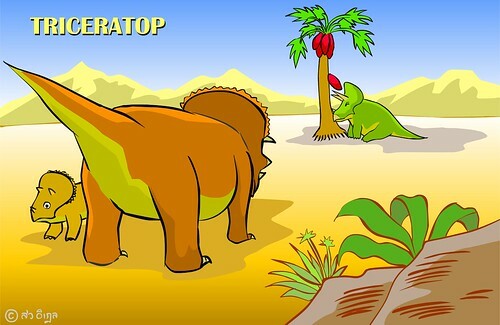 Roll mouse over the small dinosaur, you will see it bangs the head to get a fruit.